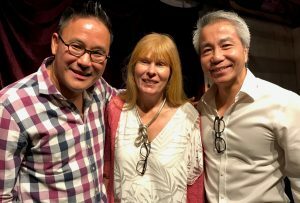 At a talk organised by Malaysiakini and BoBo Restaurant, journalist Clare Rewcastle-Brown said that Malaysia could be a political beacon for other countries in the region and has given cause to Malaysia’s neighbours to take stock of their own political systems. Her comments were received with all round applause from an audience of about a 150 people. In attendance were 2 of the firm’s partners, Loong Caesar and Ed Soo. The latter is a part owner of the venue where the talk took place. Ms. Rewcastle-Brown, known for her award winning investigative journalism in the Sarawak Report, spoke about how she stumbled upon the 1MDB story by chance when she noticed the lavish lifestyle of Reza Aziz, the son of Rosmah Mansor (the wife of the former Prime Minister), and wondered how a young professional banker with limited financial means could afford to own multi-million dollar properties in Europe and in the USA. This curiosity led her to investigate his financial means and assets and subsequently found a money trail that eventually exposed the 1MDB scandal. She said that it was a chance discovery that never would have happened had the perpetrators not lived such lavish and decadent lifestyles that drew attention to their excesses. Once she had found the material she needed to publicise her story, she felt that the real impact of the story could only be achieved if she had leverage from the big media companies and so she offered her story and evidence to the Sunday Times and ultimately to the Wall Street Journal. Once the story had been published by them, pressure began to mount on regulators to do something about what is now recognised as the biggest theft in history. This caused the US Kleptocracy Asset Recovery Initiative (KARI) to take action and this resulted in the civil forfeiture suits by the DOJ against assets worth US$3.5 billion. In her view this was also the political tipping point for the Malaysian public that now realised that a change in government was necessary. Clare explained that there were initial misgivings in the DOJ when the KARI was first established as there were detractors who considered this initiative as too intrusive in the affairs of other countries. However, with the impressive and peaceful change in Malaysia’s government arising as a result of the revelations made and the initiatives taken by the DOJ, the Kleptocracy Asset Recovery Initiative now finds a new sense of purpose and justification for its objects. In other words, Malaysia’s mature political transition on May 9 has done a great service to the world.